Oiliness and greasiness is one of the main problems I see in wedding photography. It's something that can be fixed so easily. Often both the bride and grooms faces appear oily to the point of almost sweaty. On your wedding day you will be under hot bright lights so makeup can start to 'melt' off your face, and even the slightest perspiration will show up in pictures thanks to those HD cameras. Ask your makeup artist to work with matte products, a good quality primer, and to set your foundation with powder. Keeping some blotting paper handy is also a good idea. Some HD powders show up horribly in flash photography so take some photos beforehand to be sure. And don't forget your significant other, you don't want him to look shiny either. Another common problem I see a lot is bloodshot eyes. Often it's due to a mixture of heavy makeup around the eyes and contact lenses. To avoid this problem, get a good nights sleep the night before the wedding and drink plenty of fluid. If you plan on wearing contact lenses, get used to them by wearing them for a while before the big day. And lastly keep some eye drops handy to get of any redness. Lashes don't come in a one size fits all. I often see thick banded drag queen like lashes used on the majority of brides. Lashes should be a good fit for the brides eye shape, and fill in their natural lashes. I don't know if lash extensions are available in Bangladesh yet, if they are, I highly recommend those over falsies. When picking false lashes, buy your won rather than u se make up artist supplied ones. Look for a thin band and lashes of mixed lengths so they look natural. I personally love House of Lashes and Flutter Lashes Inc. This a really easy problem to fix. Most brides want to look "fosha" but the reality is that if your foundation is too light, you'll look as if you are wearing a gray mask. Some makeup artists use baby powder or talcum powder as a finish for bridal makeup. This casts a horrible grayness over your face. The ashiness shows up worse in photos than it does in person. To avoid this, ask your makeup artist to use colours similar to your skin tone rather than white powders. Foundations with SPF also have particles that reflect grey under flash photography. There will be lots of tear jerking moments at your wedding without a doubt. Unless you are one of those girls who never cry (do they even exist?) make sure you use waterproof everything. Yes I did say everything. You don't want black tears running down your cheek taking your foundation off with each drop. Makeup application depends a lot on the condition of your skin. I know skin doesn't always cooperate but there's still a few things you can do to make your artists job easier. Breakouts and dry skin are usually quite difficult to cover up. If you end up having a breakout the best thing you can do is to leave it alone. That's right, no picking, touching, or squeezing. A small bump is easier to conceal than a large inflamed bump or worse yet - a scab. Dry patches are also a makeup artists worst enemy. To avoid this problem, drink lots of water, and use a moisturizing face mask regularly. Also exfoliate skin regularly. Its all about the perfect timing. Waxing too early leads to stubble and regrowth on your wedding day - EEK! Leaving it too late isn't that great either; think redness, inflammation and bumps. So get to know your hair growth cycle and wax at the right time to avoid puffy brows. Glitter does not photograph well. It comes out as white spots all over your face. It is best to avoid glittery powders, shadows and lip gloss. If you want a shiny look, stick to pearlescent powders, metallic shadows and satin lipsticks. But please don't use them all at once! 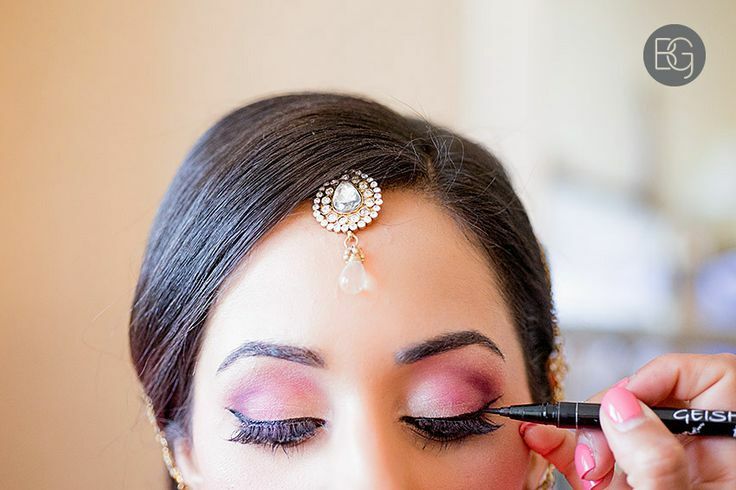 Have you come across any bridal beauty blunders?